Newhill chalked up their first win of the season by beating Glentoran at the Rec in Lisburn. Newhill failed to beat the Glens last season, drawing both games so to win so convincingly has given the lads great confidence and have set the standard for themselves. Newhill started the game on top and were winning most balls in midfield to show great energy and hunger against a physical Glens team. 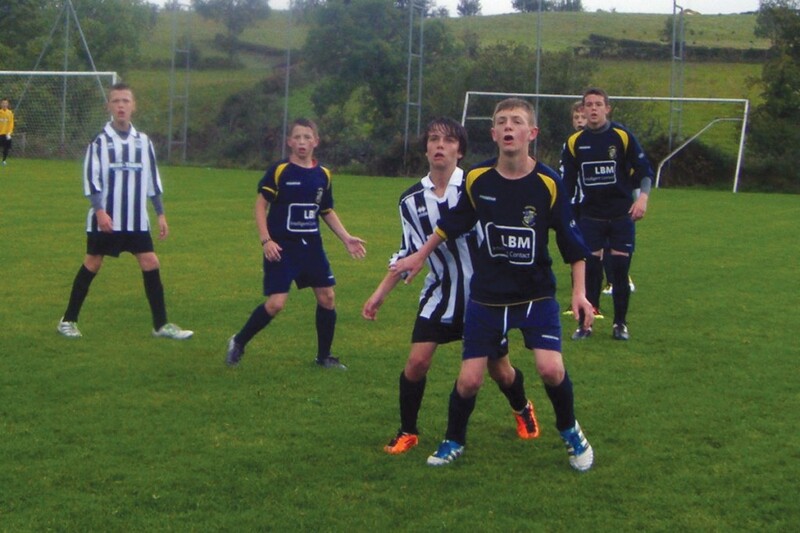 Even though Newhill started bright it was the Irish League U14 side who nearly took the lead. A long ball over the top looked to be falling into keeper Garland’s hands but the wind just caught it and Garland had to scramble to stop the ball from going over the line. The keeper then punched away a corner which was Glentoran’s only other chance of the half. Some of Newhill’s passing was excellent but they knew they had to get a goal for all their hard work. Big Dan McGlade showed everyone his power as he held the ball up 20 yards from goal, turned and sent an unstoppable left foot shot into the top corner to put Newhill in front. Eamon Scannell then had the ball in the net minutes later but the ref blew for offside as the young winger looked on in disbelief. Glentoran were on the ropes and Newhill looked in total control as the whistle blew for half time blew. The second half was more of the same as Crane, Cevo, Holden and Meighan didn’t give the Glens strikers a sniff. Scannell, Henry, Mulholland and Morris were winning the midfield battle with Keenan and McGlade up front causing all sorts of trouble. Goal number two came after Curly crossed to Henry on the edge of the box and his looping shot had the keeper beat but Big T made sure as he bundled over the line to score his second in two games. The Glens only chance in the second half saw them hit the crossbar with a long range strike and Aidan Mahon had a half a chance on his Newhill debut just before the final whistle. LBM Man of Match: Some great performances today but altogether the team share the award. Newhill travelled to take on last years cup winners Dromara on Saturday morning and they braved the weather to come away with a convincing win. Newhill had to reshuffle the team after goalkeeper Garland and captain Mulholland were both ruled out by injury, so Jordan Toner played in nets and Joe Donnelly started his first match back after injury. The wet and windy conditions didn’t dampen Newhill spirits as they started the game on top and had numerous chance in the first half. Big T shot high then Crane and Scannell both tried their luck from long range before McGlade screwed a shot just wide. Newhill’s passing and movement had Dromara chasing shadows in the first twenty minutes and you knew it was only a matter of time before a goal arrived. Curly duly obliged as he lobbed the goalkeeper from inside the box to get his first of the season and put Newhill in front at half time. Newhill were in total control of the match but a header at the back post drew Dromara level. A minute later Newhill were in front again when Henry found space in a crowded box to curl a shot beyond the keeper and into the net. The third goal came from the move of the match as Crane broke down the left and fed it to Henry who knocked it to Scannell. From Scannell’s cross McGlade was on hand to poke in from 10 yards and effectively kill the game as a contest. Some of Newhill’s passing and calmness was a joy to watch and the fourth goal optimised that. McGlade chested the ball on the halfway line before sending Scannell running down the left. He then skipped past a challenge before firing a thunderbolt in the back of the net which gave the keeper no chance. Toner made a brave save low at the feet of the Dromara striker and took a sore one for his troubles but the home team pulled a goal back just before the death. This was a good result for the West Belfast boys and moves them to top of the league. It also shows the strength in depth as they were missing three players. The new addition’s are fitting in well and we hope for another successful season. LBM Man of Match: Again the whole team were outstanding today and all deserve the award.